My Small Groups provides you with the ability to create a single page specific to each user where they can view and access their small groups, group wall, group roster, group twitter, and group Flickr photos. For illustration purposes, the setup instructions to follow are for an Arena-managed website, using the default structure and templates. 1. From the Administration menu, click the Pages option located under the WEBSITE heading. Expand Web Pages then Homepage then Members and finally Member Homepage. 2. Click the New Page branch. 3. Customize the Page Name. 4. Add a container module. 5. Add modules. Consider adding modules to the Available Content tab allowing each user to select which feature to add to the page and making placement adjustments. •My Groups – This module displays all public groups where the logged-in user is a member, leader or administrator. •Groups Photos – This module displays photos from a specified Flickr account. 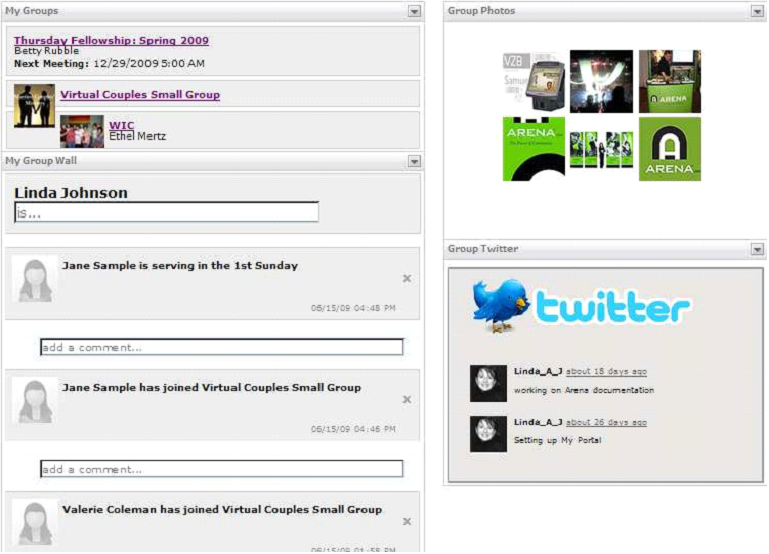 •Groups Twitter - This module displays the Group's twitter feed. If there is no Group Twitter feed setup and the logged in person is the group leader, the leader can input the account information. If you enter just a username, the latest 20 tweets by that username displays. If you enter the full credentials, you see the user’s complete time-line (their messages and messages from the people they are following). The urls, usernames and hash tags (#wwdc) are clickable and go back to Twitter. You can also use this module with no group via module/module setting. •Group Wall – This module displays a group wall where activity of members displays such as when a group member enters a prayer request, registers for an event, volunteer opportunity, etc. •Small Group Roster – This module displays the photo and contact information for group members. •My Photos – This module displays the Group’s Flickr feed. It shows the latest 45 pictures (configurable) by default. Like the Twitter module, the group can input its info here if not entered on the administration side. There are two modes for this module. The default mode is going to Flickr when a user clicks on an image (new window). The other mode is showing a larger image in an animation/viewer. Use the "Show Photo on Click" module. 6. Make the appropriate Permission changes for the page and each module.